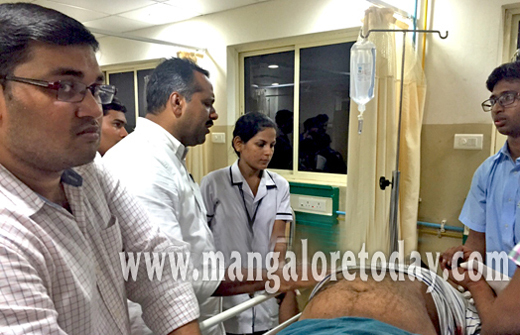 Mangaluru: July 6, 2015: The Karnataka Health and family welfare minister U T Khader has once again proved his humanitarian side by saving a life of an injured youth. The youth was driving his Suzuki Ritz, and while taking a deep curve near Natekkal, he lost control and crashed his car to the road side wall. The youth was severely injured in the accident. UT Khader who was on his way to Konaje after breaking his fast spotted the accident. Khader asked his driver to stop the vehicle and got down. Khader pulled the trapped youth out of the car and took him to K S Hegde Hospital in his car and admitted him for the treatment. Khader then came back to the spot to gather victim’s information and called the victim’s family about the accident. Soon the Victim’s family arrived to the hospital, and Khader then left for Konaje for a meeting. The victim’s family thanked Khader for immediately admitting the youth to the hospital and saving his life. Khader had shown his humanitarian side earlier by saving another youth in a similar incident in Bengaluru. Thumbs up to the minister for saving the lives of needy all the time, anytime. Thank You Mr.Khader, we are proud of you.You have taken personnel interest in informing the victim’s family is very pleased. He is doing is duty, he is a health minister and he must save the lives of people. But unlike other minister, Khader do what others don’t. Great work. full on respect for you sir. The only minister in Karnataka who works for the people and takes any step to save their live. Respect! Thank you sir. Humanity is a main factor every politician must cultivate in them. Thank you Mr.Khader for spending your precious time in saving the life of a public. If every politicians think in such a way our country can better one.